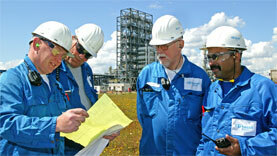 The manufacturing development and overall scope of PB-1 piping systems continues to expand. New specialised systems, enhanced installation techniques, and increased product sophistication, demonstrates the confidence of global manufacturers in the capabilities and long-term potential of PB-1 piping systems products. PB-1 needs no secondary processing so residual production can be recycled within the process and waste is negligible. Commissioned in 2003, the PB-1 plant satisfied the latest Dutch regulations on environmental impact and is ISO-9001 and ISO-14001 certified. Manufacturing Polybutene-1 is a derivative of the refining of crude oil. The monomer butene-1 is obtained from the olefins fraction of the cracking process, together with ethylene and propylene. Polybutene-1 is produced by the polymerisation of butene-1 using a very high yield, low temperature catalyst system. This, together with the fact that polymerisation takes place in solution in the monomer, means there is no requirement to purify the resulting polymer. The unpolymerised monomer is simply recovered and recycled within the process. Polybutene-1 is produced solely at a state of-the-art production facility in The Netherlands. The plant was only commissioned in 2003 and therefore had to satisfy the latest stringent Netherlands government regulations on environmental impact. The PB-1 plant is both ISO 9001 and ISO 14001 certified. Energy consumption of the manufacturing process is also extremely low in terms of consumption per unit finished product, and compares favourably with the raw material production of competitive piping systems. When compared with the raw material of traditional metal piping, Polybutene shows clear advantages in terms of kilograms oil equivalent per kilogram of material. All plastic pipes are manufactured via an extrusion process and associated plumbing fittings are made with injection moulding. Both processes involve raising the temperature of the raw material above its melting point and for pipe extrusion compressing the melted plastic through a die to form the pipe which is then cooled and coiled, or cut, or for fittings, injecting molten PB-1 into a die form which is clamped under high pressure. Some plastics then require a second processing step to produce the finished product. Polybutene-1 however is inherently fit for purpose without modification or secondary processing with the additional advantage that any uncontaminated off-specification production can be ground and recycled within the process. 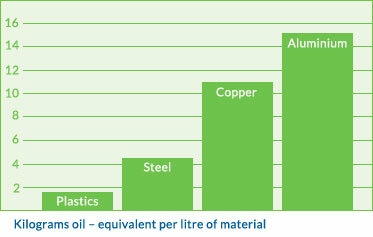 Raw material waste is therefore negligible. The production processes for PB-1 piping systems products are conventional and not specialised for the materials. Pipes and fittings of beyond 250mm in diameter and corresponding thick wall sections are possible using PB-1. The Polybutene-1 manufacturing plant is situated at Moerdijk in The Netherlands close to the oil refinery and port facilities at Rotterdam. 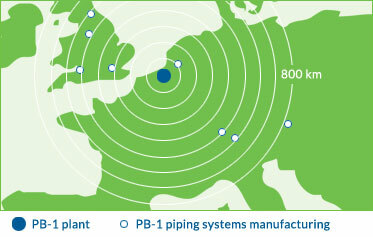 Moerdijk is also close to the epicentre of the Polybutene-1 piping systems business in Europe with the major pipe producers situated in The Netherlands, Switzerland, Germany, the UK and Austria. Butene-1 feedstock is provided from European sources in the vicinity of the plant in The Netherlands. PB-1 raw material is then shipped by road either in bulk tanker consignments or semi-bulk recyclable board containers. The finished piping products are also transported by road to the installation site. The majority of the Polybutene-1 piping systems business is nationally or European based and hence transportation distances are relatively short. Clearly, it is not possible to provide meaningful calculations on transportation energy consumption or environmental impact, but for this environmental criteria we feel confident that the Polybutene-1 piping systems business compares favourably with other competitive systems. Recycling is undertaken at each stage in the manufacture and utilisation of PB-1 piping systems. The processes for producing the Polybutene-1 raw material, for manufacturing the piping systems, and for the installation of the systems into their end use applications are all designed to maximise the use of the raw material with minimal waste. The PB-1 production plant is a state-of-the-art design, commissioned in 2003, and recycles butene-1 monomer within the process. As PB-1 is extruded into pipe, the polymer's molecular structure remains essentially unchanged. This is in contrast to some alternative materials whose structure is radically altered by the addition of chemicals or post-extrusion treatment and therefore unsuitable for in-line recycling. The manufacturing processes for both the extrusion of pipe and the injection moulding of fittings are managed to minimise waste. ISO standard 15876 specifies that a manufacturer’s own clean production waste can be re-granulated and re-used as long as it is the same grade of material to which it is being added, and that no other re-work is permissible. Any other contaminated or off-specification production waste can also be re-granulated and used in the production of lower specification products. Due to its flexibility and other versatile characteristics, the installation of PB-1 piping systems also generates very little waste. Smaller diameter pipe can be delivered to site in coils of typically 25 – 600 metres in length and cut in situ. Larger diameter joints are often pre-fabricated and delivered to site in sections, thus avoiding any on-site off-cuts. Theoretically, after decades of service, PB-1 pipe is expected to retain its original polyolefin structure and if recovered, could be recycled by standard plastics conversion techniques into ‘lower’ specification products.